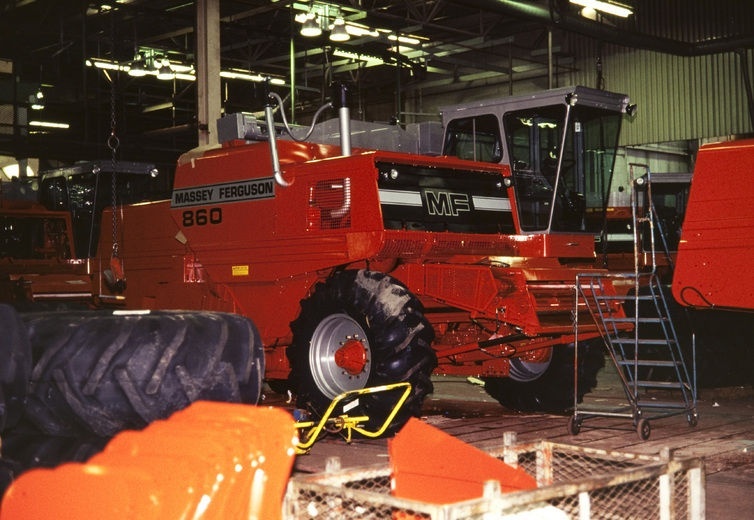 Any Website dedicated to Massey Ferguson equipment would be failing if it didn't mention what was the biggest combine plant in the world building the biggest production combine in the world from the early seventies the 760 model rolled off the production line in 1971 the original concept for this machine started in the late 1960s again Massey were at the forefront of future technologies in Harvesting. This giant plant at Brantford started its humble beginnings in 1872 when Alanson Harris moved his farm machinery workshop to Brantford, a decade earlier Daniel Massey moved his farm machinery shop to Newcastle Ontario. 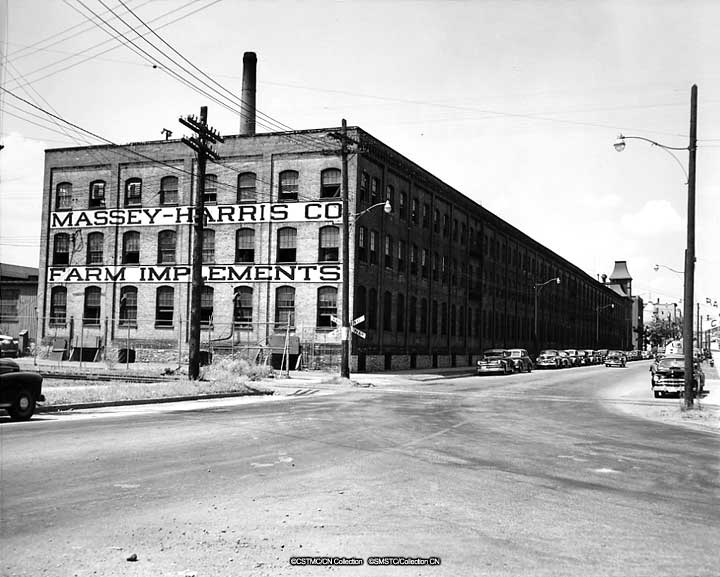 In 1891 A Harris & son merged with Massey manufacturing to form Massey Harris the new company headquarters were based in Toronto this merger spawned global sales of farm machinery and manufacturing plants in Europe as well as North America. 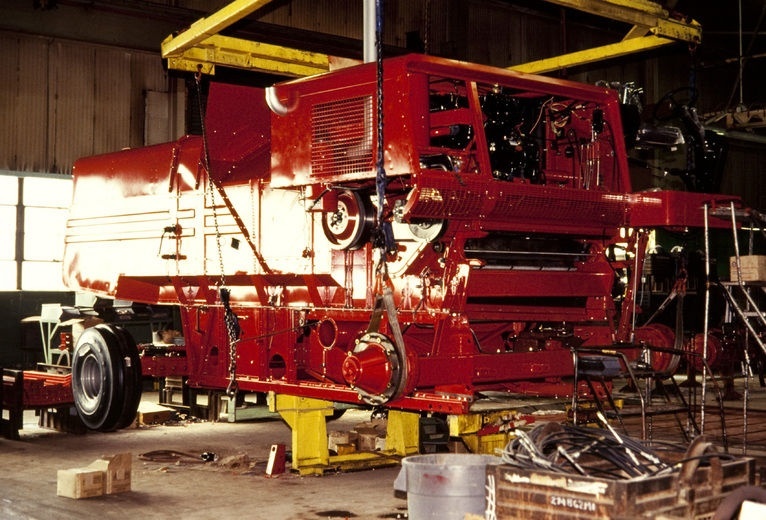 In 1911 the company had moved into the United States farm machinery market in a big way and proceeded to buy companies in the following decades including F Perkins engine manufacturer G Landini and the assets of the Standard Motor Company in England and France. Probably one of the landmark achievements associated with Massey Harris came in 1938 a young Australian Engineer by the name of Thomas's Carroll who worked for the company was responsible and credited to inventing the first self propelled combine harvester ! 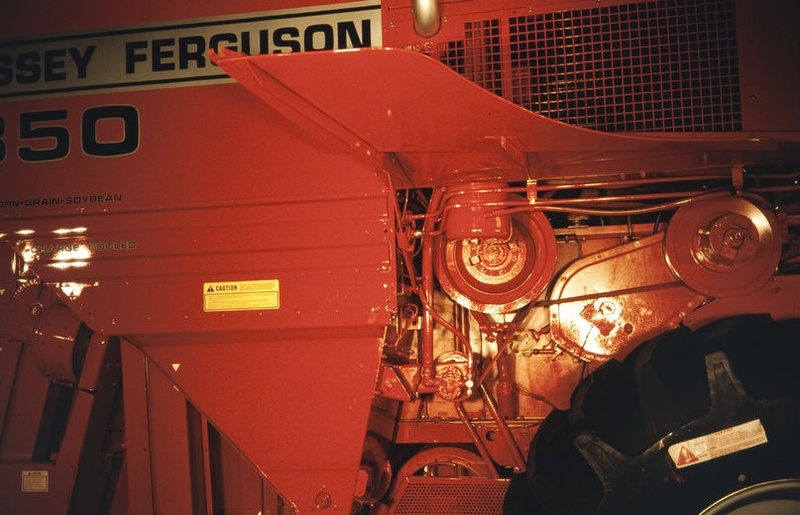 This invention coupled with Ferguson's 3 point linkage system helped the company on its way to become one of the worlds most successful agricultural machinery manufacturers, whatever colour combine you operate today its very origin and development would of came from these humble beginings, also your tractor is likely to to be fitted with the Ferguson system 3 point linkage! Another materpiece from this unique partnership. 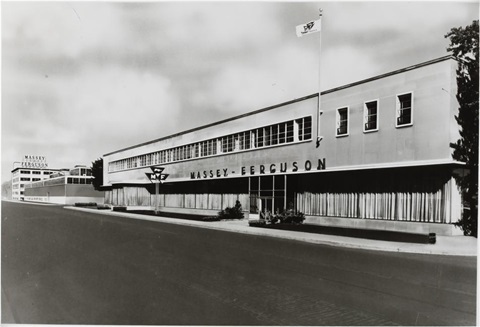 In 1958 the company was known as Massey Ferguson after the Amalgamation of Ferguson several years earlier and the dropping of the Harris name. 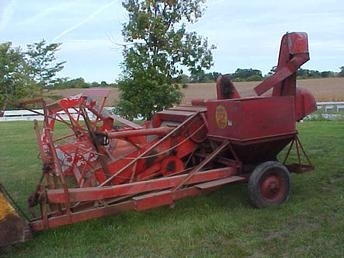 Brantford had been producing farm machinery for over 140 years the cockshutt plow company, J O Wisner and son co who manufactured seed drills and fanning mills this company also almalgamated with Massey Harris. 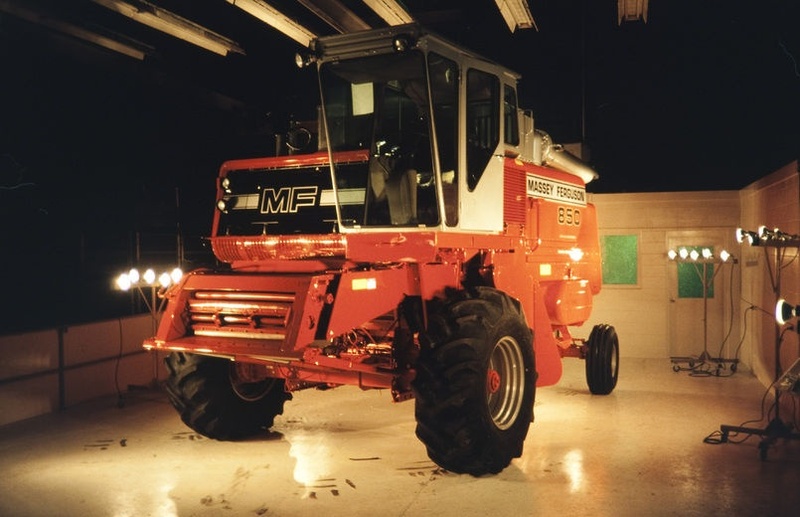 At the dawn of the sixties MF had ploughed millions of dollars into building the huge new Park road north facility covering over 300 acres ! This state of the art facility would soon be producing combines that would be exported all over the world and as market leaders the sky was litteraly the limit, several generations of families worked at the plant the wages were the best in town, and it seemed at that time nothing would stop this roller coaster from supplying the latest technologically advanced combine harvesters to the rapidly growing population who needed more food produced year on year. 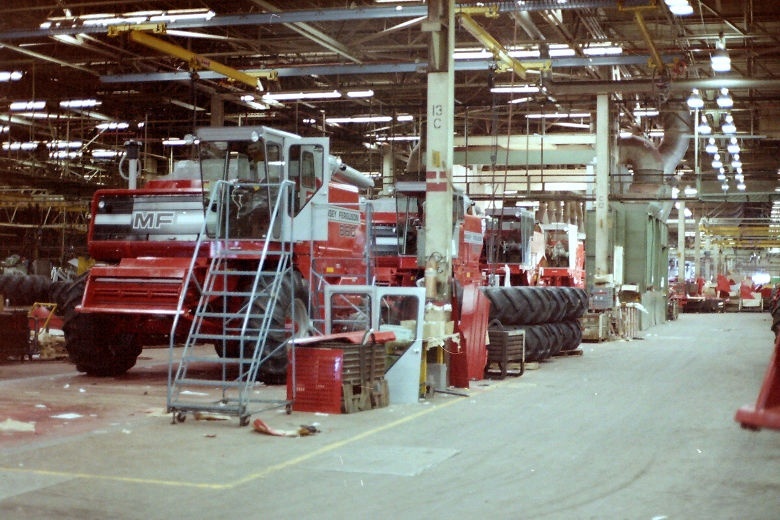 Brantford at this time was blessed with highly skilled workers and the best engineering brains available, at the turn of the seventies the several year in design and trialed launch of the 750/760 was well received by the home market which was huge also these models would eventually be supplied to other parts of the world including Europe the first one arriving in the Uk the summer of 1974 initial valuation of the combine was not as expected the heavy crops and long straw meant the combines would need modifications and a maximum width of 18 ft table where as in the drier lighter crops of the state's and Australia they would handle a table width way in excess of that. 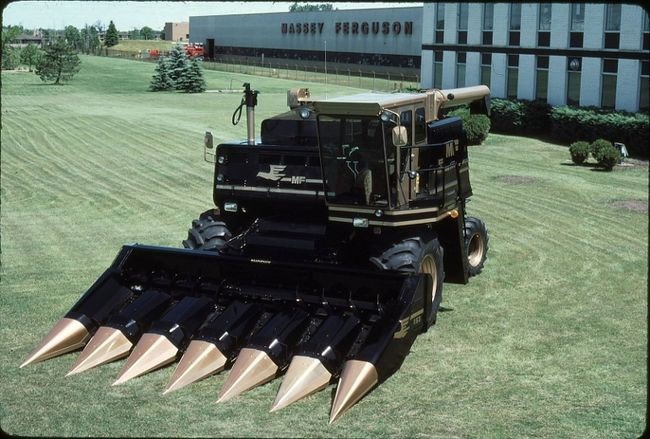 The 750/760 combine was the machine of choice for most of the farms and custom cutters in the states, the dealer back up of the product was second to none in these Times with a convoy of parts and engineers moving across the country with the migration of the ripening crop similar to the legendary harvest brigade of the 40s 50s. 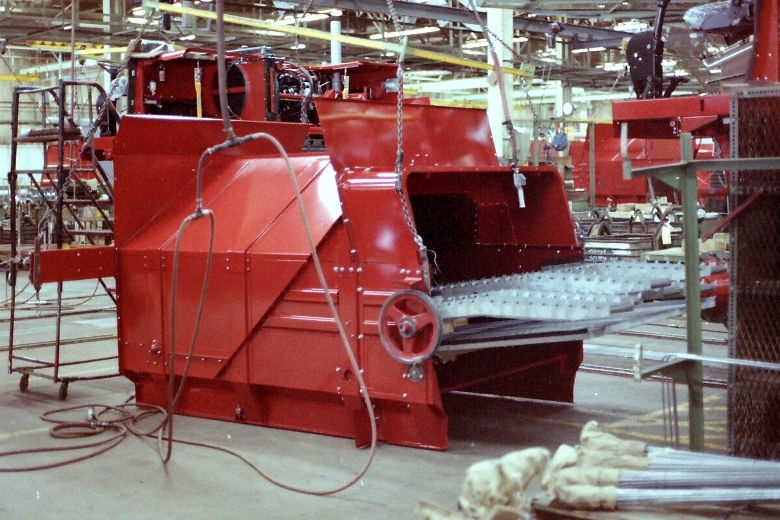 Within a decade of the 700 series launch the 800 series would feature state of the art electronics digital shaft speed sensors,hydrostatic drive transmission the 85 series had a 5 channel digital tachometer to monitor fanning mill speed ,cylinder speed,all of this was fully adjustable electrically, also a triple sieve shoe to break up heavy chaff accumulations, also the use of polyurethane paint that would retain the combines deep red glossy shine for longer. As with all large industries in the western world at this time the plant was heavily unionised, but when you compare the disruption caused by disputes and walkouts compared to other plants inc Kilmarnock and later Marquette in France, a part from a few minor issues this plant had a pretty good track record. 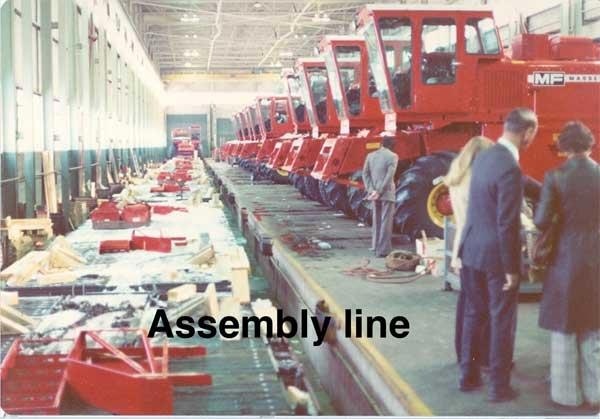 As you can imagine all of this technology didn't come from nowhere and wasn't cheap to obtain, Massey Ferguson would test all there products and parts extensively around the world in harvest seasons, also at there own Brantford facility but to stay ahead of the game the cost was very high indeed, it has been said that the combine division was for several years a cash cow for research and development throughout the company and this reflected in the lack of funding in the later years for future combine development,although Massey had been developing a rotary model as early as 1979, and contrary to many beliefs this was there own design and not Whites as would eventually go into production. 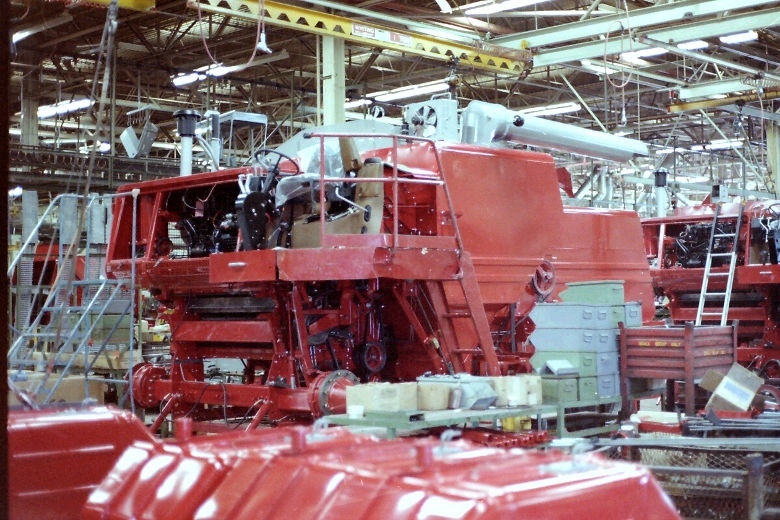 The acquisition of White farm machinery gave Massey Ferguson a rotary Combine that was well designed and developed over several years in fact Cockshutt White had been working on the rotary concept since 1962,Massey spent a good deal of resources turning this into the biggest rotary production combine available in the world but sadly there was very troubled times approaching that few could imagine not least the generations of proud families that worked at Brantford. 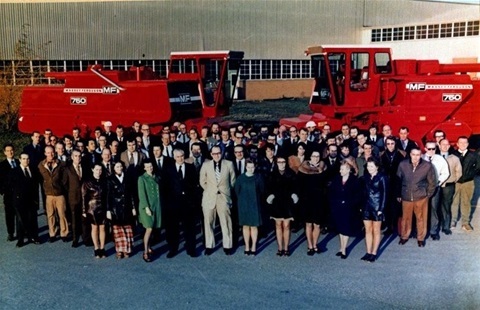 When you look at the figures of this company from the past its quite impressive in 1961 they had 27 factories in 10 countries and nett sales at that time of $591 million and they employed over 40,000 people, Brantford was not only building combines they also built balers, swathers ,muck spreaders, and tractors it truly was the capital of farm machinery manufacturing for Canada, with an impressive 567,900 sq ft of floor space, the plant had the capacity to build up to 60 combines a day subject to demand. One story that captures the changing times that would add to the many problems that this business faced was this. Rick Carter who was a manufacturing engineer for Massey Combines Corp said one morning a truck driver from Winnipeg arrived to pick up some machine parts at the plant and unfortunately there was a delay in getting him loaded so Rick invited him into his office for coffee, while they chatted the trucker said he and his brothers owned a 5000 acre century farm and they were told by the banks the farm valued at $5 million dollars they could borrow 20% of its value which was $1 million so the brothers borrowed $800,000 to purchase new machinery for there enterprise this was in 1980. Then two things happened !! Farm commodities dropped, and interest rates shot up to record levels !! After a few disastrous years with financial difficulties the Banks valued there farm at just $2 million so they could only now borrow 10% which equated to$200,000 the Banks demanded $400,000 immediately from the original loan which the farming business didn't have, which forced the seizure of the farm and 3 houses and even the kids bank accounts!! The trucker said my brothers are now separated from there wives and I think when I return to Winnipeg most probably my wife would of filed for divorce!! Rick stated that this one incident of many that were to beset this business was to him the grim reality of what the farming industry had been experiencing and it set the wheels in motion of the hardship that was to beset this plant. Special thanks to everyone who supplied the forthcoming photographs and particularly Ray Bianchi for his hard work and help. 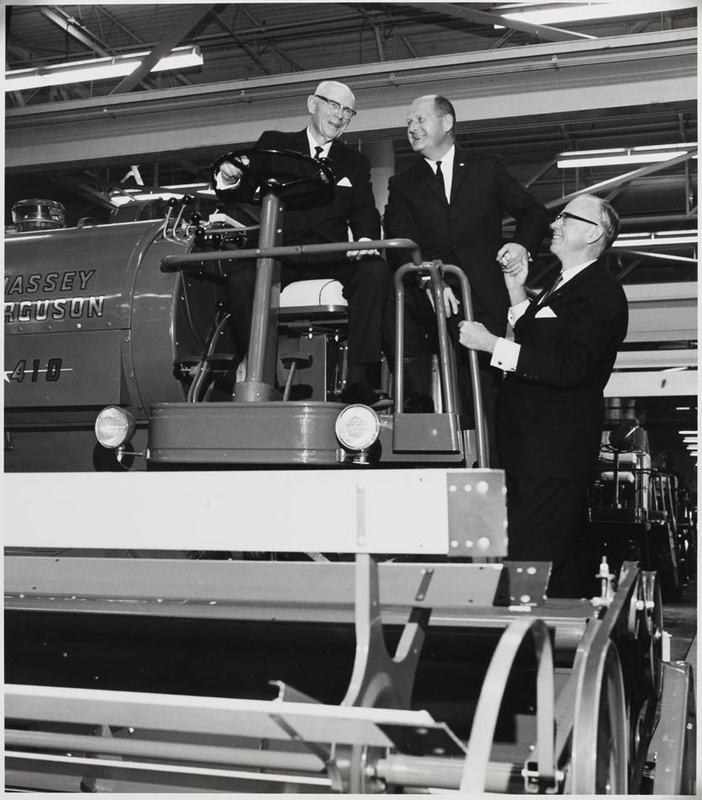 Retired ex chief harvesting engineer and inventor of the self propelled combine harvester Tom Carroll visits the plant , he is seated upon a 410 circa 1962. Tom was honoured with the Cyrus Hall McCormick gold medal by the American Society of Agricultural Engineers. A publicity shot showing staff in front of a couple of 750s probably early seventies! In my opinion it would be foolish to think that just one thing resulted in the closure of this mighty plant to me it seems it was caught up in what seemed a perfect storm! World wide ressesion, mis management of corporate funds,not having the money to invest in what was futuristic designs Massey engineers had on the drawing board,and not concentrating on what they were good at instead throwing money at developing markets in countries that would unlikely lead to any volume sales they enjoyed nearer home. In 1980 the Canadian government paid out $250 million to bail out the ailing company this was brought about by owner Conrad Black donating his company shares to the employee pension scheme. 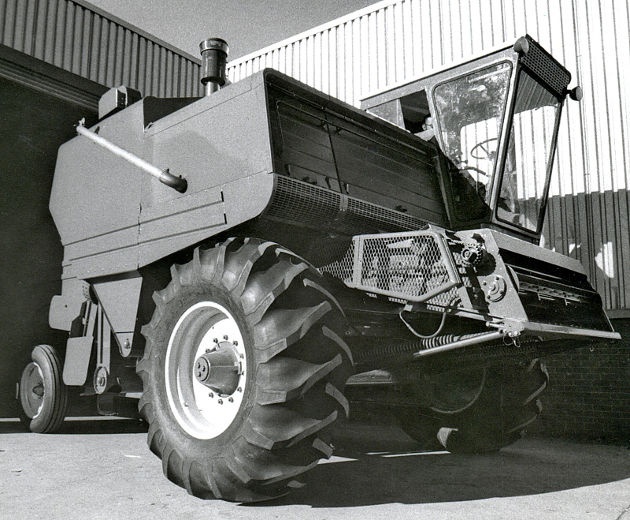 The company was now known as the Varity Corporation, this would eventually lead to the spin off of several loss making divisions into an entity 're named Massey Combines Corporation. 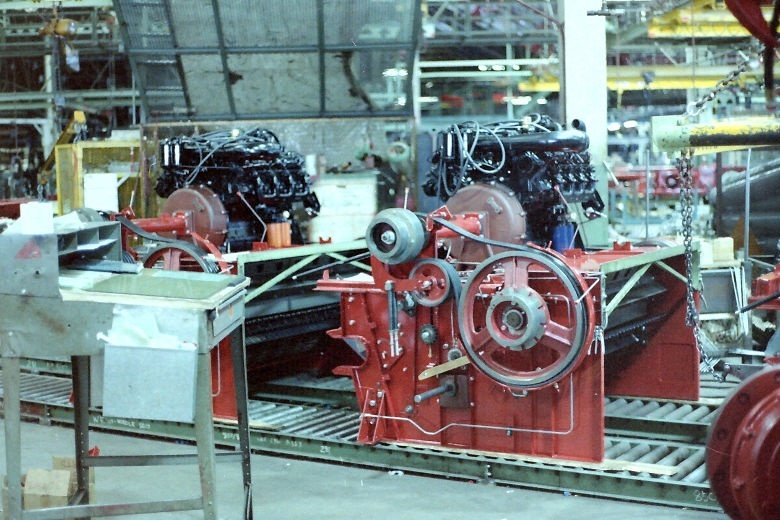 But sadly on March 4 1988 the insolvency of the company was announced and 2600 staff at this plant alone walked out of the factory for the last time, the company had amassed debts of $290 million!. The shock waves of this closure came about a decade after the closure of the other combine plant in Kilmarnock Scotland, for the workers of Brantford it was devastating many lost there homes,some there marriage, and others were left jobless those who were lucky to find jobs went from 15/16 $ per hour to about $8 ,some moved from Brantford to seek work, some of the Engineering staff went onto forge careers in other industries, and others for rival companies. For sure Brantford would never be the same even today the bitterness of this closure and the legacy of loss it left behind is still felt, up until about 2013 most of the buildings stood although it stood several fires and vandalism also water damage, it was a constant reminder of the past for those who lost so much, but in the last couple of years demolition and the massive clean up of this heavily contaminated site has begun and what promises to become a new future for this area of employment. When you think of what this plant and people of Brantford contributed to the world it can't be underestimated, proceeding the war years with a broken Europe and heavily in debt America's the battlefront was feeding a growing population,and with the Engineering excellence of these companies mentioned here and the skilled proud workers of this Canadian city of Brantford things might be a whole lot different today, for what we have today in farming we owe them a huge dept of gratitude and for that they should be rightly proud. 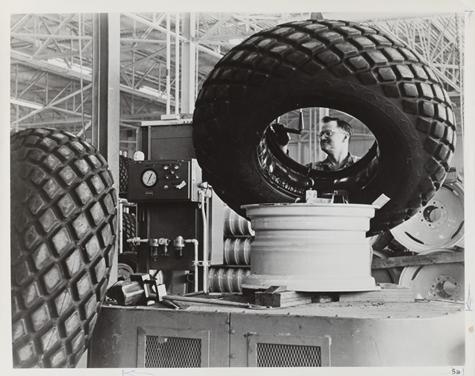 The story of Brantford is worthy of a whole website unto itself with the specific timelines of what this plant produced in its lifetime, I hope this page has given a snapshot of its importance in this company's history. What follows now is a selection of photos from the hey days of Brantford. 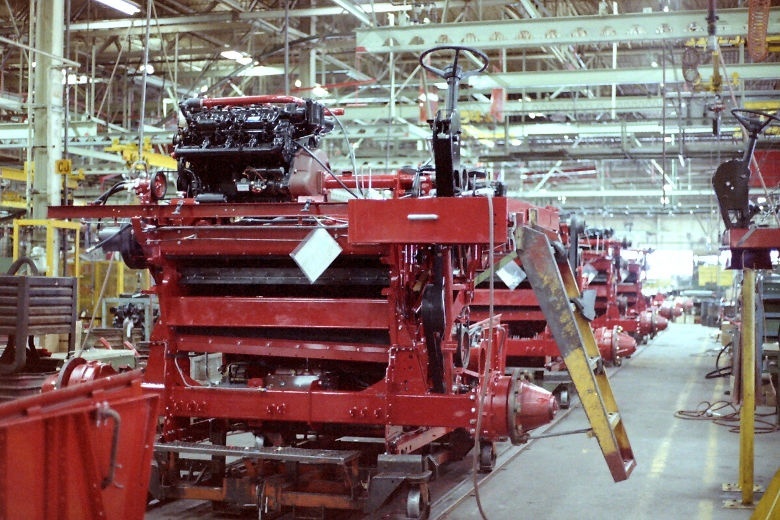 700 series combine on the production line engine mounted, several others behind. 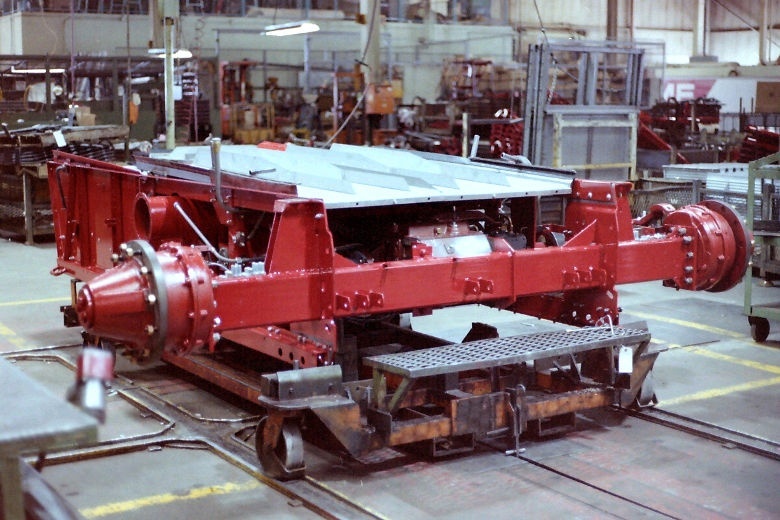 Front axle assembly and rear chassis, start of assembly. 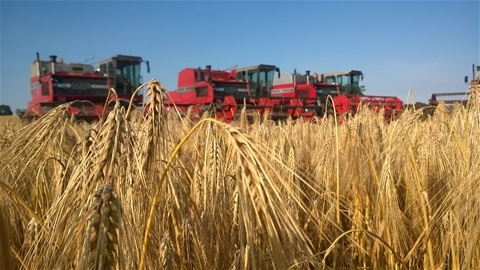 Centre section of combine showing straw walkers fitted. Centre section engine mounted above main threshing cylinder. Combine fitted to dollys for ease of movement in assembly. Combine front, middle, and rear sections fitted, note the fuel tanks waiting to be fitted in bottom of photo. Combine tethered to overhead crane rear wheels fitted , front elevator cab and hydraulics to be fitted. 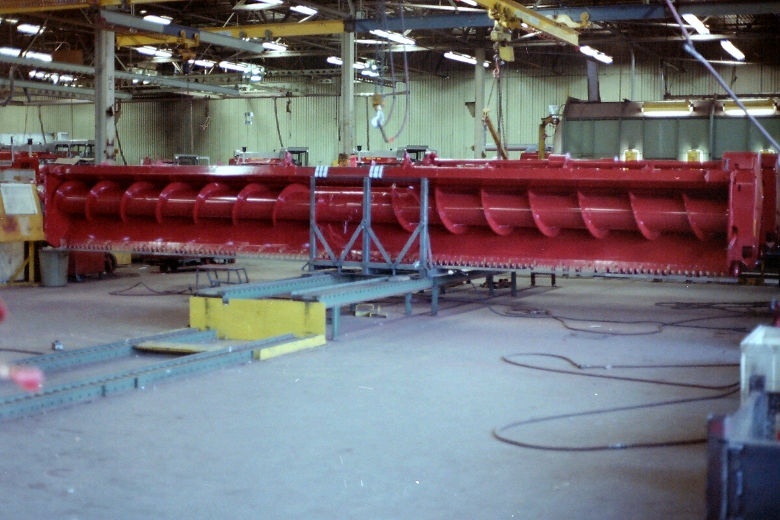 Construction of the table (header) auger!! Combine now mobile cab fitted and front elevator note front wheels awaiting next machine!. Final inspections of components on this 850, decals added. This 860 completed and awaiting final inspections and running up of all components. A showroom shot here, probably used for pr or brochure photos!! This prototype is thought to be the only one in existence!! Brantford combines at home in the world's cropped fields. 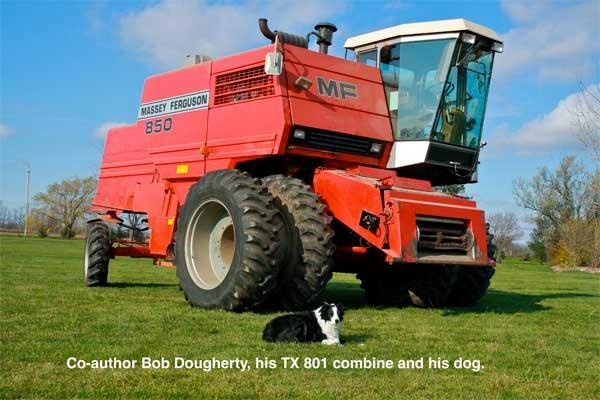 During the relaunch of the ailing company in 1985 a special one of Massey Ferguson 860 was built to be used to highlight the company's combines and future commitment to there customers this combine its said cost over $100,000 dollars to build ? It had a special paint job Black with gold lettering,a cab decked out with a velour interior, also a logo of a bird to represent the Phoenix rising from the ashes!!. 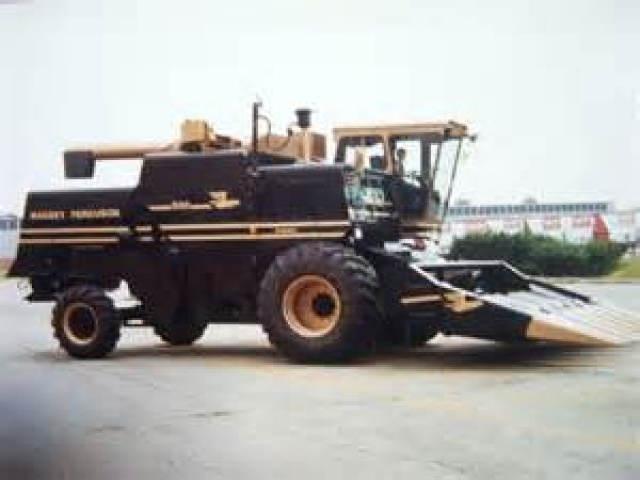 Apparently the black and gold colour scheme was an idea from a Massey engineer who got the idea from the John player special car racing team black and gold colour scheme!! 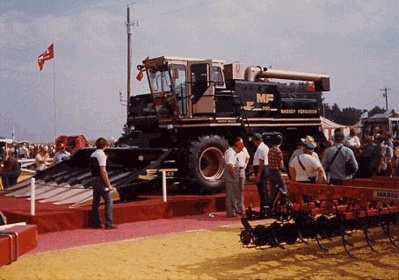 The Combine was hauled around the USA to the farm progress shows but sadly despite these last valiant efforts the odds against this company were just to great. The combine was sold to a big customer of Massey Ferguson, it's life then went unrecorded until a few years ago when it was put up for sale it had had a hard life and was purchased by a farm from Kansas, I am currently waiting for current pictures of its condition, but I have been told its in a semi derelict state!! Which is a great shame as it would of been nice to restore this particular model out of all of them to pay homage to what was one of the most respected Agricultural companies in the World. 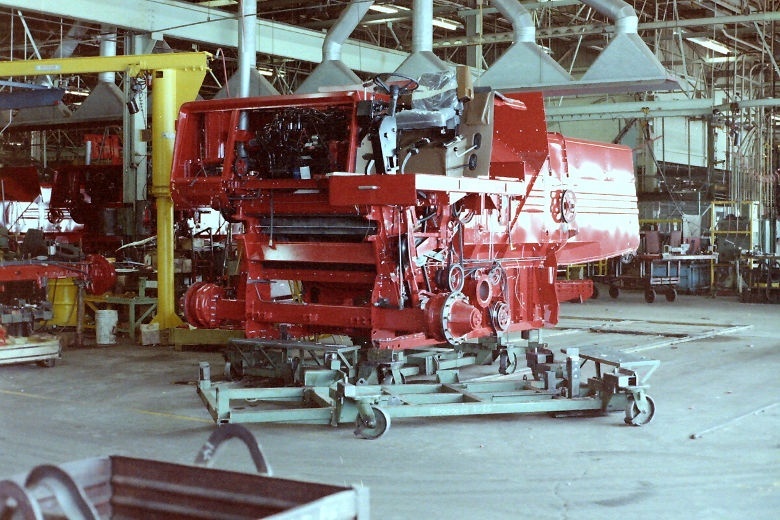 The Phoenix seen here outside the Brantford plant fitted with a matching corn head. Another side shot of this one off special 860!! 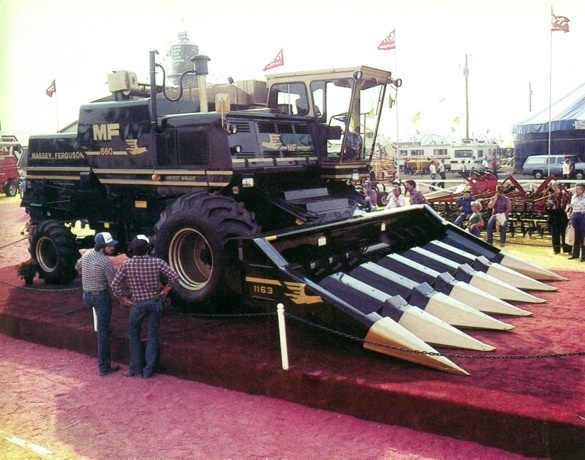 Seen here at the Illinois farm progress show mid eighties!! 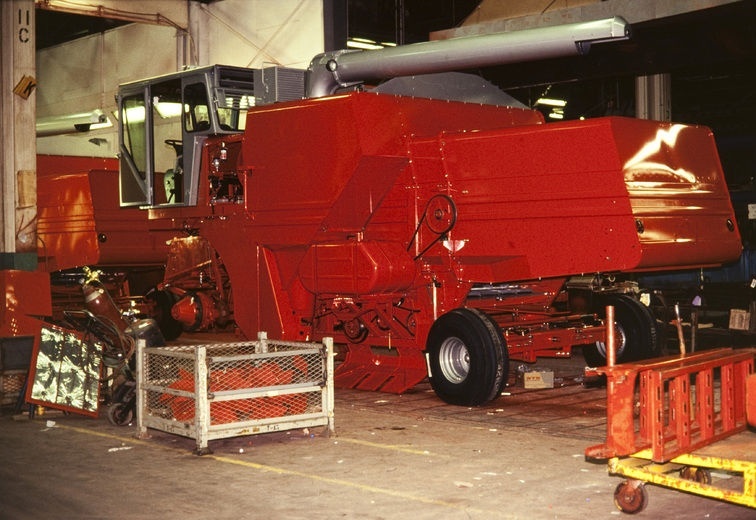 The very special Phoenix 860 Massey, this combine was a dedication to the Harvest Brigade who gave so much! 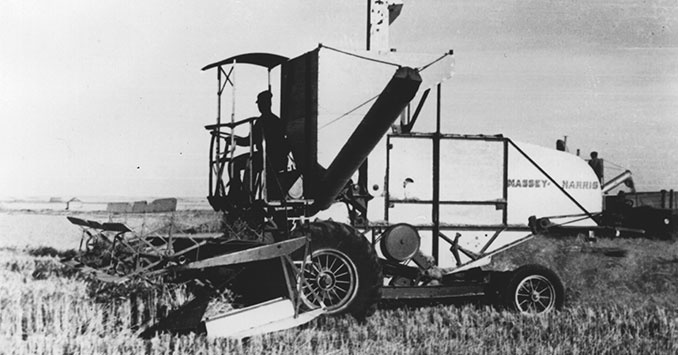 And shaped the course of history for crop harvesting mechanization. A look at Mf Rotarys! !